MINOX: Marvel in Miniature by D Scott Young (e-mail youngds@comcast.net) 185 pages, large paerback format, print on demand. It is divided into two sections, the first being a history of the camera line and the inventor, the second being a primer in photography with specifics geared to the Minox user. Specific points of interest to a reader include a personal interview with Walter Zapp, the inventor, and correspondence and articles that have not appeared previously in America. 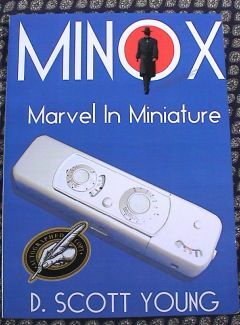 MINOX: Marvel in Miniature can be obtained from Amazon or from Barnes & Noble.com, both have the book. B&N charged 18.34USD plus 4.29USD P&H . The book is a print on demand done by xerography and perfect bound with a four colour laminated cover--possibly it is a Xerox Docuteck . It is published by 1st Books Library. Their site is worth visiting (www.1stbooks.com) where a print version can be ordered for 15USD (plus the phony S&H) or downloaded for about 4.95USD as a PDF and you print the copy. Some autographed copies have been sold on Ebay. As this book is only a few USD, to get a pdf from the publishers, it has the single distinction of all material on Minox at being extremely inexpensive even cheaper than the hardback book from Minox which has a very weak (in detail) potted history. It is also a fascinating read and completely different to the other two great works of Hubert Heckmann and Moses. Among other interesting details, in the interview of Walter Zapp, it is noted that Walter Zapp has been disappointed in the Minox association as a spy camera. The pictures are not of the quality of Moses' Spy Camera but what do you expect from a laser printer versus offset on coated paper? The chapters on the history of the Minox and Zapp's thoughts in it's design making interesting reading as can be seen from a note by D Scott Young (Design influences of Leica on Minox) or a paying a visit to his homepage at http://mywebpages.comcast.net/youngds/.